If you are visiting the area on holiday and wish to fly, PLEASE contact a member of the committee to get permission to fly one of the privately owned sites. They will be able to tell you the opening and closing times of the sites and any special conditions that may apply. 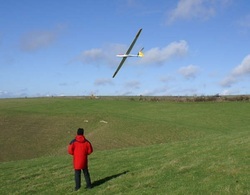 The club uses a PRIVATE flying site, 2 miles to the west of Winterbourne Abbas. This has a rolled and close mown grass runway that measures 60 metres in diameter, a car parking area, it's own entrance from a concrete farm track, and is available 7 days a week. The sites fall into two categories with permission to fly (Private) sites and PUBLIC SITES. A natural bowl that is capable of flying with wind directions from SW through South to SE. Please do not use Channels 72 and 79 at this site as they are in semi-permanent use on the other side of the road. (North slope). Although the top of Eggardon Hill is National Trust, the surrounding slopes are privately owned. The Marquis club has exclusive rights to fly the North slope by the local farmer who is a member of this club. 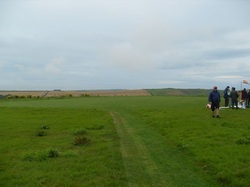 PUBLIC SITE: MAIDEN CASTLE- North slope/north east facing slope. PUBLIC SITE: WHITE HORSE - South facing slope. Also used by hang gliders.